In the aftermath of Monday afternoon's announcement of the Basketball Hall of Fame's 2011 class- during which we learned that Chris Mullin, Dennis Rodman and (finally!) Artis Gilmore, among others, would be enshrined in Springfield- once I'd telepathically conveyed congratulations to the dozen honorees, my thoughts shifted to the subject of players not in the Hall. Unless you count the curious decision not to even include Reggie Miller (25,279 points, five All-Star selections) among the candidates up for consideration, there wasn't a particularly egregious snub among 2011's first-year hopefuls. I began rummaging through childhood memories and historical numbers, in search of transcendent performers and statistical standouts that have thus far been deemed unworthy. Soon after, on Twitter, the digital barbershop at which the individuals behind the NBA blogosphere congregate daily, the conversation turned to one of the the most mythologized players of his era, Bernard King. As is often the case when discussing King's career, sentiment was on his side, but quickly gave way to pragmatism. It's almost unanimously agreed upon that a) at his peak King played Hall of Fame-quality ball, but that b) he was robbed of too much floor time (he essentially missed four full seasons) by knee injuries to be a top-tier candidate. I loved King as a player and have rooted for him as a Hall of Fame candidate for as long as he's been eligible. However, without looking closely at the numbers from his entire career, I'd lazily accepted the conventional wisdom about his career to be true. Yesterday, after yet another "yeah, but..." assessment of his legacy, it became clear that as a fan and an amateur NBA historian, a closer look at the matter was needed. Upon closer inspection, I'm pleased to report that a) not only is Bernard King deserving of enshrinement, b) he's kind of a no-brainer and c) the notion that he was healthy for no more than a few seasons is something of a misnomer. Let's deal with this last point first. 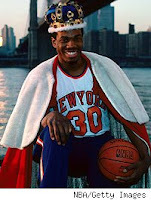 King's career spanned 16 years, during which he played 12 seasons- ACL injuries cost him two full seasons and limited him to just six games in 1986-87. Sure he was prone to injury- and serious injury at that- but his is as much a story of perseverance as it is fragility and susceptibility to injury. With his explosiveness no longer at an elite level, the Knicks released him at the end of the 1986-87 season. In the face of this adversity, he recovered and authored an excellent four-year comeback with the Washington Bullets, during which he improved his scoring average each year he was with the team (17.2 in 1987-88, to 20.7, 22.4 and 28.4 in 1990-91) and earned the fourth All-Star selection of his career 1990-91. The fact is that he was actually on the floor a lot more than he was off of it. In the 12 NBA seasons in which he played, dude took the floor in 64+ games ten times, and had seven seasons in which he suited up for at least 77 games. His career total of 874 games played trump the tallies of no-brainer Hall of Famers like Sam Jones (871), Bob McAdoo (852), Elgin Baylor (846), Jerry Lucas (829) and Walt Frazier (825). Meanwhile, in his time on the floor, a lightening quick release keyed his fantastic midrange game, while his strength and explosiveness made him a terror on the fast break. In dominating much of the 1980s, King cemented his status as one of the most explosive and prolific offensive players in NBA history. He stormed out of the gate as a rookie with the New Jersey Nets in 1977-78, averaging 24.2 points and 9.5 rebounds per game and setting a franchise record (that held until 2005-06) with 1,909 points and earned an All-NBA First Team selection. Of his ten seasons with 64+ games played, he averaged 20+ points in nine of them (twice each with the Nets, warriors and Knicks, three times with the Bullets), and topped 24 three times. He never had a season, however short, in which he shot less than 47% from the field, and during his five-year peak (1980-85, with the Warriors and the Knicks) he shot at least 52% from the field, three times hitting at least 56.6% of his shot attempts. Twice he posted a True Shooting Percentage of more than 61%, and three times his Effective FG% topped 56.7%- the man was not a "volume scorer." All that and hardly a word about his ridiculous 1984-85 season, when, despite playing just 55 games, he scored 1,809 points, good for a league-best 32.9 per game. On January 30 and 31, 1984, he became the first player in 20 years to score 50+ points in consecutive games, dropping 50 apiece on the road against the Spurs and the Mavs. The following season, on Christmas Day, 1984 at MSG, King spectacularly torched the Nets for 60 points- hitting 19 of 30 shots from the field and 22 of 26 free throws. This is a franchise-record that still stands. For his career, King wound up with 19,655 points (22.5 per game) and 5,060 rebounds (5.8 per) in 874 games. The only other players in NBA history to rack up 19,000-6,000 in under 900 games? Elgin Baylor, Larry Bird, and Bob Lanier. Also, over the 16 years during which his career took place (1977-93), just eight players- Moses Malone, Alex English, Larry Bird, Adrian Dantley, Dominique Wilkins, Robert Parish and Kareem, all Hall of Famers- scored more points than King. Throw in four All-Star selections, a pair of All-NBA First Team nods (1983-84 & 1984-85), along with a Second (1981-82) and a Third (1990-91), and we might be onto something. If your going to build a case against Bernard King for the Hall of Fame, you can't really do it based on a lack of productivity due to time missed. If you're planning to make such a case, you're probably better off doing it on the grounds that his teams achieved only limited success. King appeared in the postseason five times, playing more than six games in a single postseason on just one occasion, 1984. However, if you begin down this road, you'll also need to mention that in those dozen games, he averaged just under 35 points, and that his five-game first round duel against Isiah Thomas and the Pistons, in which he averaged 42.6 points, remains the stuff of legend. And there it is. Unless, as we've done with all other "individual honors," Hall of Fame candidacy is now reliant on team success, rather than strengthened by it (in which case, we need to give George Gervin the boot and induct Robert Horry immediately), there is little to suggest that Bernard King, one of the most dominant and memorable players of his generation, does not have a place in the Hall. Perhaps as a fan (of King, I'm not a Knicks fan), I'm biased. Or, thanks to the spectacular performances, incredible productivity relative to his peers and better-than-expected durability, perhaps we'd do well to set aside our preconceived notions and reassess Bernard King's career.